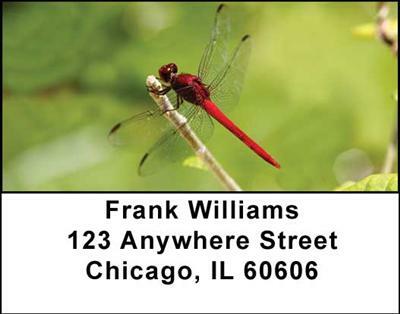 "Dragonflies Address Labels" product is already in your cart. The colorful beauty of these Dragonflies Address Labels will add drama to the business of sending mail and provide endless hours of inspection as you look at these delightful creatures. Each of the four scenes depicts a different color dragonfly and the exquisite intricate detail of their bodies is amazing to see – peacock blue, tangerine, royal blue, and deep orange – all provide a glimpse of these interesting insects as they cling to branches and other objects. For those that love to see Nature up close and personal, you will enjoy these Dragonflies Address Labels and will be entranced by observing them as they go about the business of life.